I look after the Marketing at Learnlight, I'm Head of Global Marketing. Learnlight is an EdTech company that specialises in providing blended language and soft skills training to corporations around the world. We've been in existence in different forms for about 25 years. Learnlight is a relatively new brand that we launched approximately a year ago from the merger of various companies that came together under the brand. So the last 12, 13 months has been an incredibly interesting period, and [there have been] a lot of projects from both a branding and a merger point of view. So it's been a bit of a ride for the last 12 months. We've had a lot of fun actually, and we've had a lot of support from Strategic Internet Consulting as well. 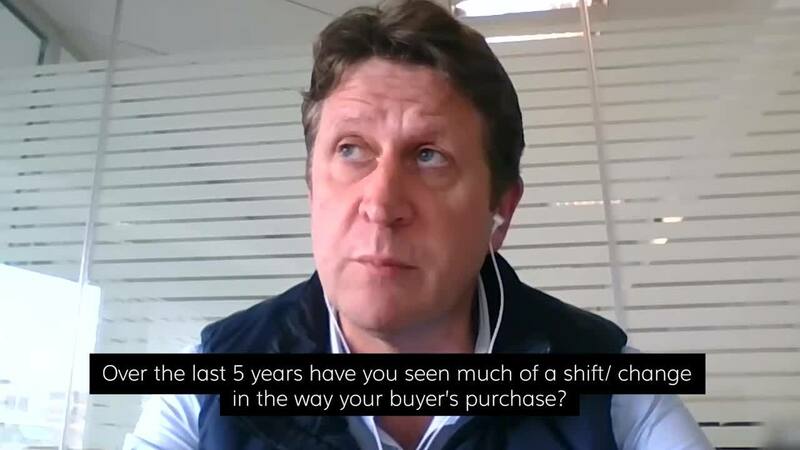 Over the last 5 years, have you seen much of a shift / change in the way your buyer's purchase? If we're looking at 2018, so maybe going back five years to 2013, I think some of the shifts we've seen are probably common across many sectors and industries. I think the buyer is obviously a lot more savvy in terms of the information they have. We're finding that the buyer is lot more educated, a lot more informed. They have got access to a lot more resources; everything from LinkedIn to blogs, to sector-specific trade press, forums, events (online or physical). We all use LinkedIn every day, and we all see what's going on. There's such an enormous amount of information that people have at their fingertips. So I think from our point of view when we're talking to potential clients, we're finding them a lot more informed than ever before. People are also potentially a little bit more wary of taking large decisions and making large purchases. So I think a lot more players become involved in a decision, which makes it more interesting; particularly from a marketing point of view of not just talking to one potential person, but to several from different departments. Some of the shifts we've seen are probably common across many sectors and industries. I think the buyer is obviously a lot more savvy in terms of the information they have... we're finding them a lot more informed than ever before. How has Learnlight responded to these changes as an organisation? Some of the things we've had to do, particularly thinking about the different persona, people and departments involved in the decision making process, [involve] trying to do a lot more mapping; to understand whether it's procurement or any other department that could be liaising with our main buyers; who tend to be within HR or learning. I think that's one of the key areas that we've responded to. [There's] a trend that we've seen that we're having to answer, in terms of providing more personalised solutions and more personalised learning journeys as well... marketing has to come in and provide a lot more information... supporting the sales team along that whole journey as well. I think the other area (thinking from our end-consumer point of view; the learners, as we're a training company); is looking at those learners and trying to identify what they actually require. There's a level of personalisation here, both at the buyer level in terms of personalising the offer, but also at the level of the end-consumer. That's also a trend that we've seen that we're having to answer, in terms of providing more personalised solutions and more personalised learning journeys as well. And that's obviously where marketing has to come in and provide a lot more information; supporting material, collateral - and supporting the sales team along that whole journey as well. What industry-specific sales and marketing challenges are you seeing? I think one of the challenges we're seeing is - going back to my first point about the volume of information - is that there's so much information out there, that there's a little bit of information overload. I think clients are having to try to sort out the wheat from the chaff in terms of trying to find out which sources are good, reliable sources of information. And also, which vendors or potential vendors in the case of Learnlight are companies that can actually provide them with information that can answer some of these challenges. So I think there's a sense of information overload out there in the education sector. There's also a sense of [competition], because we're in the EdTech space and a lot of companies are working with technology trying to help companies; whether it's through HR technology or through general education technology. There's a sense (at least from our clients and our potential clients), of trying to understand the technology, and trying to understand its complexity to know whether or not it's actually going to be an easily deployable solution. So there's definitely a sense of 'everyone needs technology'. But at what price, and how difficult will it be to actually implement. There's a sense of information overload out there in the education sector... clients are having to try to sort out the wheat from the chaff in terms of trying to find out which sources are good, reliable sources of information. Have you come to any conclusions about how best to overcome those challenges of over-education? What we've found to be successful is to support the client (or potential client) in that decision-making process and as they're making these decisions. It's a longterm project in terms of; these are not decisions that get made overnight. There are many moving parts and also many actors taking part in this process. I think what we've found to work quite well is to engage with the clients at the right time, with the right channel. And also making the right and sensible mix of marketing automation and human contact. At the end of the day, what we [Learnlight] do is a very human thing; helping people to speak another language, or to perform well in a meeting, or to be able to work successfully within another culture. It's a very, very human thing. What we've found is that the more we can help our clients to understand these issues and [help them to] engage with our experts at the right time, that seems to be quite successful. What we've found to work quite well is to engage with the clients at the right time, with the right channel. And also making the right and sensible mix of marketing automation and human contact. In your opinion, what sales and marketing tactics do you see delivering highest value for your organisation over the next 12 months? Obviously a lot of people are looking at this at the moment and trying to make it work; but I think particularly [the tactic that offers most value, is] trying to align our sales and marketing as best as possible, and trying to make sure everybody is aligned behind the same challenges and pains that our clients are exhibiting [is key]. I think the more that we [Learnlight] can do that in terms of providing the right information at the right time, either directly to the client, through our marketing channels or indirectly to our clients through our sales organisation; that's proved to be quite successful. A second [value tactic] that strikes me is the more we can do less of a 'shotgun' or 'scatter gun' approach in terms of marketing to many. So, the more that we can try to market to fewer in terms of getting under the skin of our potential clients and getting to know them as much as we can, [the more likely it is] that when we are talking to them through our marketing it resonates to a high degree. I think that's one of the things that we're finding is working. We're trying to produce the best, most useful content possible for our clients... The content that we produce, in different formats and through different channels is definitely resonating and helping our clients understand the different challenges that they have. But I think the final thing (and I think this is the most important thing, which goes back to the earlier message around the excess of information and the fact that clients are trying to find the right information) - I think we're trying to produce the best, most useful content possible for our clients. And I think that's definitely been reflected in the feedback that we've had from our clients and from prospects. There's been a very high level of engagement with the content that we're producing. There's definitely a sense that we're actually helping them [prospects] to make a very informed decision. The content that we produce, in different formats and through different channels is definitely resonating and helping our clients understand the different challenges that they have. How has technology impacted the way you go to market? Well, like most companies, we have a quite a sophisticated CRM system that has been rolled out across the whole business, which everybody in the business; from sales to marketing, to product, to client management is actively using. We use automated marketing technology in terms of HubSpot which is quite well known to many people, which we've embraced across the organisation and found to be very useful to centralise most of our marketing efforts and automate much of what would previously have been done manually. I think those are the two main tools that we deploy. What kind of data does this provide you with that perhaps wasn't available five years ago? I think previously a lot of this data was available, but you had to pull it from different places. Some things you had to pull from your CRM, and others you'd have to pull from maybe some excel spreadsheets that you had to maintain yourself manually. I think the beauty of any kind of automated marketing system such as HubSpot is that you can centralise a lot of this tracking and a lot of this recording in one place. You can equally, at the touch of a button, make some very informed decisions about how successfully your campaigns are running, what level of engagement you're getting, or what level of interest you're getting from your clients. You can... at the touch of a button, make some very informed decisions about how successfully your campaigns are running, what level of engagement you're getting, or what level of interest you're getting from your clients. So I think that's saved a lot of time. It helps me as the Head of the Marketing to make some informed decisions. And it helps my wider team actually, which is quite interesting. It helps them to be made aware of what campaign to run; and how successful each one is. I think the automation piece is probably the key, followed by the ability to make much better decisions about what we do with our marketing budget.